We have received your communication and will respond to you shortly. Colombia iss beautiful and blessed with over 300 beaches. Most of these have tourist services and some are natural paradises away from the crowds. Cartagena, a large beach resort city, is one of Colombia's hot destinations with its intense night life, exquisite cuisine, international cultural festivals and lush scenery. Its colonial walled city and fortresses are also declared by UNESCO a World Cultural Heritage Site. Santa Marta and various other beach towns along the pacific shoreline make Colombia an exotic destination to enjoy and Party! Bogota, the country's largest city as well as its capital is a great place to visit. There are various places to visit such as the Gold museum, which contains the largest collection of pre Hispanic gold collection. Celestino Mutis Botanic Gardens which is covered by forests with lakes, waterfalls and over 2000 species of plants. you will understand why it is called "the city of eternal spring". The Barranquilla Carnival is a vibrant and colorful spectacle indeed! 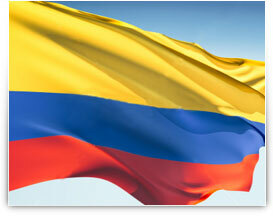 Colombia is Passion! Colombia is Salsa! Colombia is beautiful people!